Postcards from the path: Credit and thanks where it's due. Credit and thanks where it's due. I've been very remiss. Those of you who know my work and some of the story of how I've made my journey into the world of Classical Japanese metalwork may have heard me mention my first study trip to Japan having been as a Winston Churchill Travelling Fellow. I've not really elaborated on this and I think it's time I did because I owe that foundation a great deal. My own fellowship was awarded in the autumn of 1993 and allowed me to spend 10 weeks in Japan and to get my foot in the door, so to speak. You can learn more about the WCMT from their website here and this is quote, taken from that site, explains how it came about. The Winston Churchill Memorial Trust was established when Sir Winston Churchill died in 1965. Thousands of people, out of respect for the man and in gratitude for his inspired leadership, gave generously so that a living memorial to the great man could benefit future generations of British people. Every year around 100 fellowships are awarded to individuals in various categories to allow them to travel anywhere in the world to further their studies, research or simply to experience a different culture's approaches that are relevant to their own work. The idea being that these fellows would then share the fruits of their travels with their own working community. In fact it was Graham who first planted the crazy notion of being a full time artist in this field in my head. He's got a lot to answer for really ;-) It was though our many and lengthy conversations that I began to realise that accurate information, at least in the West, about the technical aspects of tosogu manufacture was essentially non-existent. In time I was to discover that the situation wasn't all that better in Japan but I'll write about that another time. The initial application that was required by the Trust was a simple, one paragraph, explanation of what you wanted to do, why and what the outcome might be. Apparently my desire to go to Japan and seek out a real Sensei and to study first hand with practising artists was seen to be a good idea. I was living in Penzance, in Cornwall, at the time, 6 hours by train from London. I was duly informed (by post...no internet back then) that I'd earned a 15 minute interview, return train ticket included. I arrived on the appointed day, having set off from Penzance at some ungodly hour to catch the earliest train, with 5 minutes to spare. A quick freshen up in the bathroom and I was briskly escorted in to the interview room by Sir Richard Vickers. A slightly built, retired, military man who reminded me of my grandfather, also a retired military man. I say, interview room, it was more of a ball room really. At least it felt like that to me. I was seated in front of a table of 3 interviewers, like a more refined version of Pop Idols, while Sir Richard seated himself slightly behind and to my right. A thoughtful touch, I felt, in that his presence was very reassuring. The questions I was asked were very thoughtful, probing and insightful and allowed me to express my enthusiasm for my project and to convince the trustees that I would make good use of the opportunity were it offered to me. One answer, to a question I imagine all candidates were asked, was probably very different from most and may have helped my cause a little bit. I was asked what the memory of Churchill might mean to me personally. Of course, the obvious reaction to that name is to reflect on his leadership through those terrible years of World War II and every British person would have older relatives who endured those times. My own family being no exception. I grew up in the Veld of the West Coast of South Africa though, surrounded, beleaguered one might suggest ;-), by young Boer boys who still harboured a great deal of hatred for the "rooinek". I was one of only 3 English speaking boys at the Vredenburg town school, bizarrely, we all had surnames beginning with H. Hansen, Hoskins and Hallam. There was another English family called Hutchinson but they were all girls. Being the new boy in town and quite a lot smaller than the local farm lads, all prospective Springbok rugby players and built like the proverbial brick outhouse, I was seen as fair game. Being very blond and well spoken didn't improve my chances of survival much either. 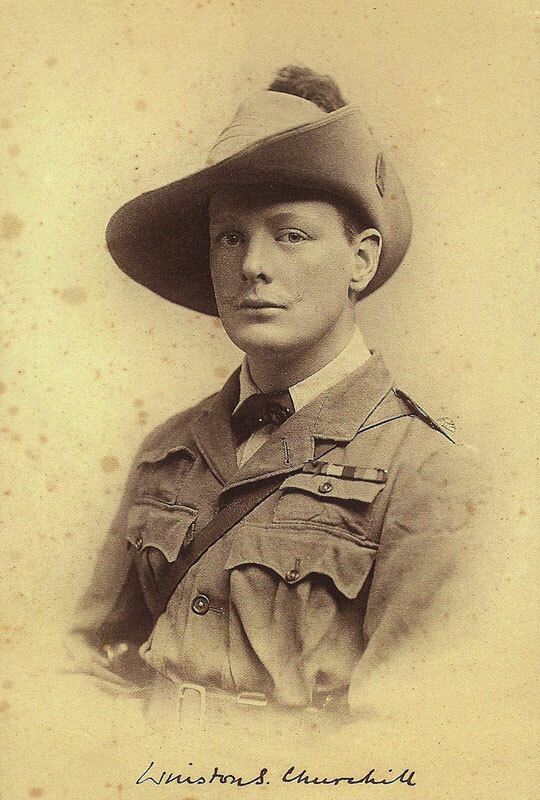 It was in an attempt to arm me, at least psychologically, that my father told me the story of how the young Winston Churchill, a war correspondent in the Anglo Boer War escaped imprisonment by the Boers and evaded capture while travelling over 300 miles to safety. The image of this resourceful Englishman outwitting he Afrikaners was evidently enough to bolster my courage in the face of a number of unpleasant "incidents"
My "trials" came to an abrupt end when one of the bigger lads tried to push me over so that they could all have a game of footie with me. Somehow I managed to grab his fingers as he reached out for me and I had him on his knees bagging for mercy before I had time to think. I admit that even now I can remember thinking I'd grabbed a tiger by the tail and that once I let go I'd be in even more trouble. To this day I don't quite know what happened next but somehow the collective anger that had been directed at me melted away and was replaced with a sort of grudging respect. The tension dissolved, my "captive" seemed resigned and so I just stepped back and let him go. I never had any problems with any of the farm boys after that. I later mastered their native tongue and even managed to get myself picked for the school rugby team. No-one thought to ask if I knew the rules though....they just appreciated my willingness to get stuck in. Needless to say, I was never noticed by Springbok talent scouts. I didn't relate the details of this particular story in my interview but I did explain how, as an English boy growing up in the veld, the Young Winnie had been a great inspiration. I think they rather liked that, especially Lady Mary Soames who is Churchill's youngest daughter. The Winston Churchill Memorial Trust placed a great deal of faith in me when they awarded me my travelling fellowship. I hope I've delivered on my promise and I remain grateful to the memory of a great Englishman. are you related to him? Last I spoke with him was a few years ago and he was in France. I would love to catch up with him. When Outlook 2010 need to open an Exchange mailbox, IT support staff or end users do not need to waste time manually to provide a user name andname of the mailbox server.Email designers will be stuck building emails using the same clunky combination of tables for layout, inline CSS and font tags for many years to come. Almost 25,000 people have joined the chorus to send a unified message to Microsoft about their lack of web standards support in Microsoft Outlook 2010.Outlook 2010 download, information, including those outside the definition of the default installation settings. Microsoft Project Standard 2010 Download gives you a new and easier way to manage projects. With significant updates and visual enhancements, Project Standard 2010 delivers better experiences to simply be more productive and successfully complete all types of projects. In Acrobat 9 Download, you can simplify planning with inactive and activetasks to perform what-if analysis. Adobe Acrobat 9 Pro Download takes diagramming to a bold new level with dynamic, data-driven visualization tools and templates, powerful process-management features, and advanced sharing capabilities through the web. Bring the big-picture and real-time data from multiple sources, including Microsoft Excel 2010 and Microsoft SQL Server, together in one powerful diagram with vibrant graphics such as icons, colors, and data bars.